Police in Scotland have said people should have to register to buy knives in a bid to tackle some of the worst knife crime in Europe. Senior officers want shoppers to produce identification and then have to wait for a period of up to five days for the knife to be posted out to them. In Scotland last year, 51 people were stabbed to death. Detective Chief Superintendent John Carnochan said selling one less knife could stop a murder. The Strathclyde Police officer told BBC Radio's Good Morning Scotland programme: "Scotland has a unique problem in Europe with regard to the use of knives for assaults and violent assaults." In February, ministers outlined plans to double the maximum jail sentence for possessing knives to four years and raise the minimum age for buying knives to 18 from 16. 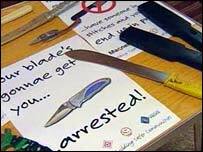 As well as the "cooling off" period for the sale of knives, the Assocation of Chief Police Officers Scotland wants legislation curtailing the open marketing of knives in shop window displays. 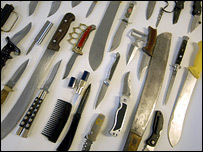 Knives should be displayed in locked cabinets within a shop. The association also wants anyone convicted for carrying a knife, regardless of the length of sentence, to be banned from ever carrying a knive of any length or articles with a blade or point in public. Det Ch Supt Carnochan insisted more needed to be done to restrict the sale of knives. He said: "All we're suggesting is that if you go in to buy a knife, that we ask for an address and identification and I would suggest further that we would then post the knife to you. "That seems to me reasonable. "If we look at it in isolation, it may not seem a lot, but if the access to one knife by one person prevents one murder, I think it's a really good idea. "We have to do absolutely everything, we have to look for a thousand victories to make this work." The officer said police had no idea how many knives were sold or in circulation, but that the most common weapon among young people was lock knives. He called for action on their sale to try to prevent young people getting access to them. When it came to buying ordinary cutlery, there would be a judgement call to make. "Fifty-one people died in Scotland last year as a result of knives, that's a unique problem and I think we have to have a go at this and look at every aspect of it," he added.